Porsche has spent the last few weeks building hype for its 992-generation 911 sports car, and the latest entry in this campaign comes courtesy of the brand's Exclusive Maufaktur division. A post on Porsche's official Facebook page displays a selection of photos showcasing options that prospective customers will be able to add to their 911 if they so choose, straight from the factory—for an added cost, of course. The particular 992 Porsche has chosen to show off is a mid-range Carrera 4S model. Its biggest distinction from the standard model is a bare carbon roof, which both adds a dark accent to the car's Chalk Gray paint and reduces vehicle weight up top. This 992 also gets carbon fiber mirror covers to match the roof. Other exterior features include smoked headlights and blacked out 911 Carrera badging. 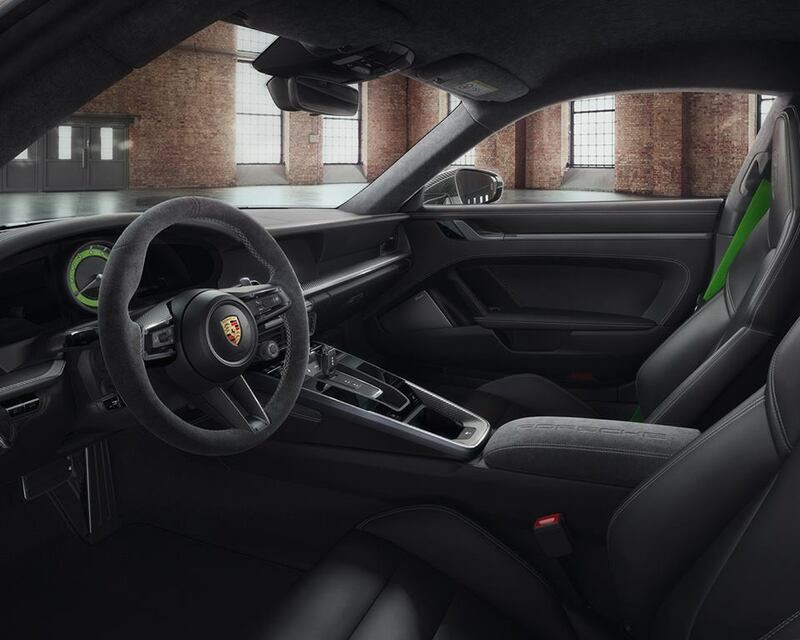 On the inside, black and gray upholstery is contrasted by bright green seatbelts and other highlights in the car's gauge cluster. A Porsche shield emblem is also seen imprinted into the 911's leather headrests. 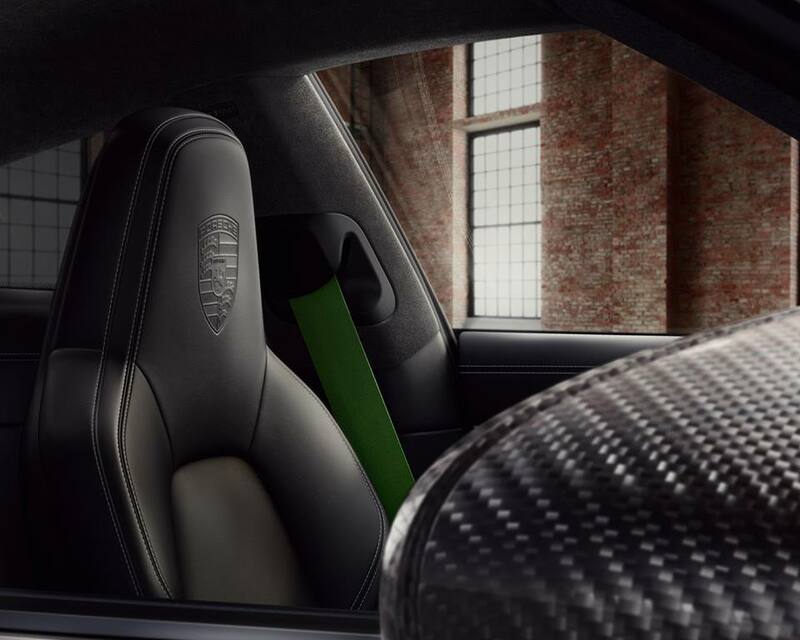 The steering wheel and center console lid are wrapped in Alcantara, with the wheel also getting carbon trim. The 992 Carrera S will get a revised version of its predecessor's 3.0-liter twin-turbocharged flat-six engine, with horsepower up to 443 and torque up to 390 pound-feet. While the new 911 looks similar to the outgoing model, it sees many changes under the surface including re-tuned handling and aerodynamics. 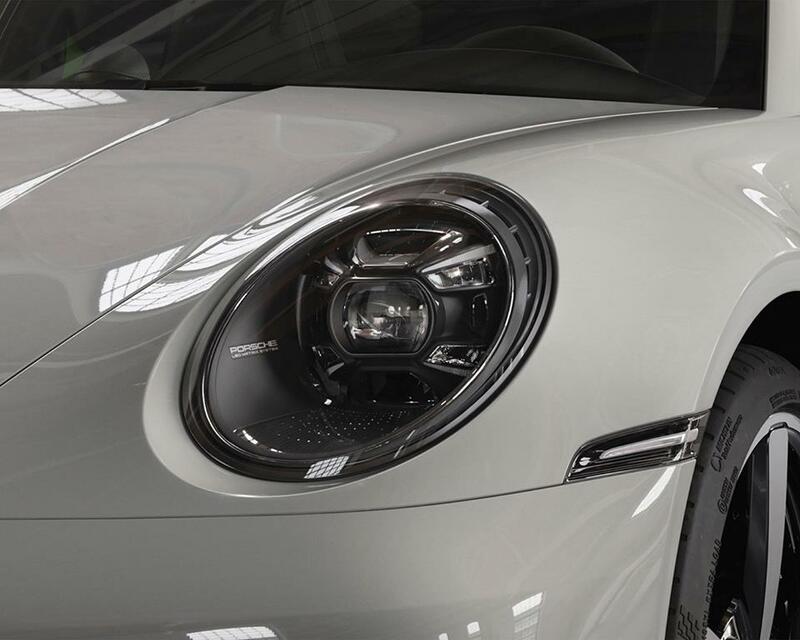 The 992 also packs a new eight-speed PDK gearbox, with a manual transmission option to come in the model's future. This newest rendition of Porsche's flagship sports car will arrive at dealers this summer as a 2020 model. The rear-drive Carrera S and all-wheel-drive 4S are currently available to order starting at $113,200 and $120,600, respectively. Options from Porsche Exclusive Manufaktur, however, are sure to set the car's true price higher. Turns out, the new Carrera S is quite the vocalist. In regards to powertrain specs, one Porsche exec is pointing to Panamera S E-Hybrid as a reference point. What's the best way to sell a performance EV? Use ICE terminology.